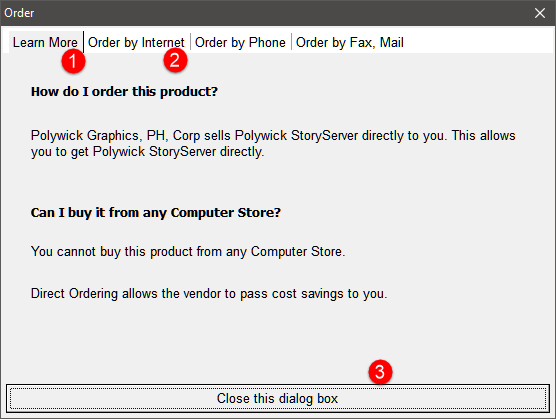 Various ways to order StoryServer. 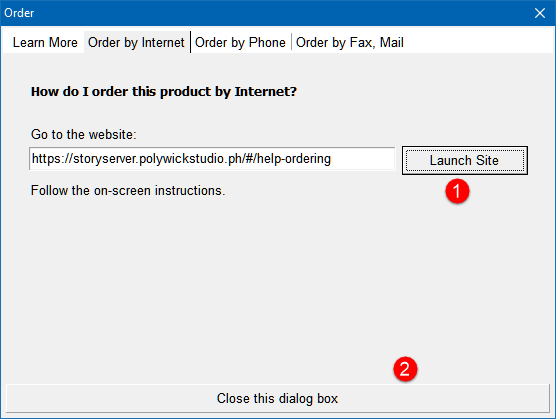 StoryServer comes built-in with instructions how to order. How to unlock this product. Various editions of this product and differences. An unlock code is also known as serial-number, serial or activation code. After pressing Alt+H,O the How to Order dialog shows. This shows various methods how to order this product. Tab 4 - Instructions how to order by mail or fax. Tab 1 - Learn about direct-ordering. Click to view purchase options on-line. After you order, an unlock code will be sent to your email address. Enter the unlock code in the dialog below. Go to On-line shopping cart. Update to update to latest. Additional support for SSO, server-based deployment. Ability to remotely access StoryServer via HTML5 interface add-on. Google, Apple, Microsoft, Telegram, Facebook for Work connectors for multiple users.